Popular game show is now playable on your computer. This fun game show presents trivia questions covering music, movies, sports, science, history, and games. 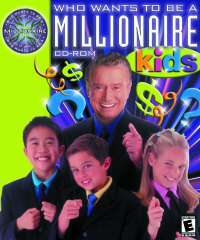 Children can join Regis in this version of the original television show, Who Wants to Be a Millionaire? Here, the kid-appropriate questions cover music, movies, sports, science, history, and games. Children can play alone with Regis or against a human friend. All the trappings of the television show are here: the lifelines, the lights, the swelling music. New to this version are secret codes—special abilities that can be activated such as unlimited 50:50 lifelines. While not as academic as the previous two titles, it’s a blast!